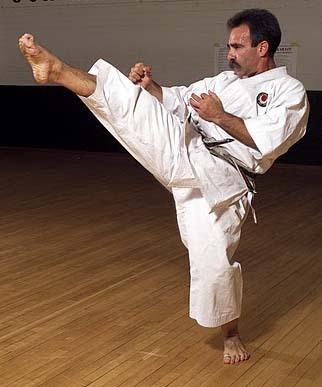 Sensei Edmond Otis, 8th Dan (Shotokan), has practiced karate since 1967 and is the International Chairman & Chief Instructor for North America of AJKA-International. He is known internationally as a competitor, instructor, coach, and judge. He now resides in Hawkes Bay, New Zealand. His Essential Shotokan DVD/video series provides detailed technical instruction and training tips for beginner to advanced students - and is an outstanding teaching and class-planning tool for instructors. Sensei Otis is a Senior Lecturer on the Faculty of Health and Sport Science, at EIT, in Hawkes Bay. Before his move, he was Director of Martial Arts at the University of California, Riverside, the largest collegiate martial arts program in the United States. He travels extensively throughout North America and Europe, conducting seminars for instructors and students that focus on karate as a rigorous and demanding physical art, an effective and decisive means of self-defense, an exciting competitive sport, and a philosophy of life. Sensei Otis has coached numerous youth and adult competitors to national and international championships, and has personally developed many high-ranking instructors. In addition to his lifelong involvement in martial arts Sensei Otis is also a licensed psychotherapist, speaker, and consultant. He coaches private clients, businesses, and organizations to successfully apply cutting-edge research and classic martial arts strategies to a broad range of life's professional, personal, and interpersonal challenges. Click here to read an excellent review of Sensei Edmond Otis's Essential Shotokan DVD series.